Over the summer, 36 incredible images were submitted from our students, postdoctoral fellows, research associates, research professors, and facility staff for the Summer 2016 NUANCE Center Image Contest. These beautiful images were produced using the NUANCE Center instrumentation. Online voting took place September 7-27. The votes have now been calculated, the results are in! Below are the finalists for the NUANCE Center Image contest for the Summer 2016!!! and 8 Honorable Mention prizes ($25). Meet the students and staff who produced the images. Learn about the science and research behind the images! Food and beverages will be provided!! IMAGE: Image shows the grain morphology across multiple layers of aluminum deposited via additive manufacturing. The build direction is bottom to top for the image. The colors represent crystal orientation according to the color legend at the bottom left corner. Elongated grains are seen across multiple layers due to partial re-melting of previous layers. Instrument used to produce image: EBSD using the FEI Quanta SEM – NUANCE Center/EPIC Facility. 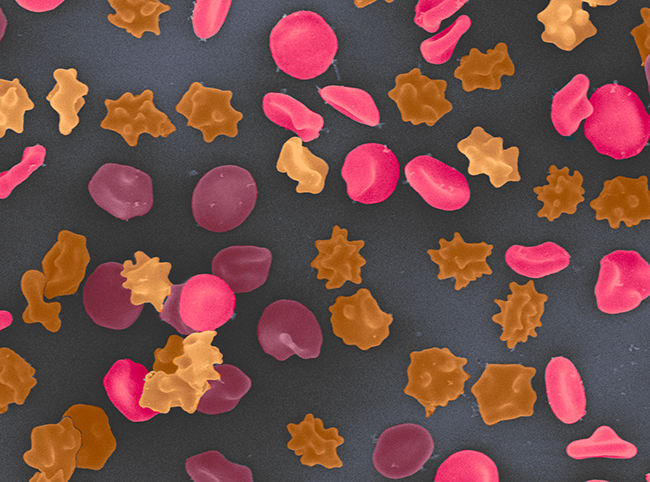 IMAGE: Red blood cells at different stages of osmosis after exposure to a hypertonic medium. 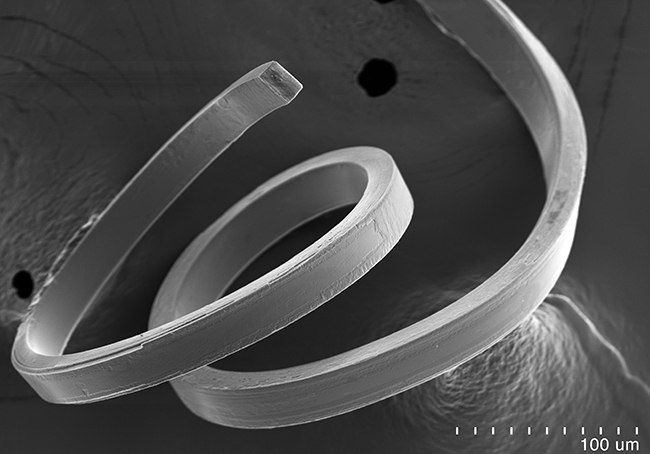 The micrograph was recorded with the cryo-SEM S4800. The image width is 50 µm. 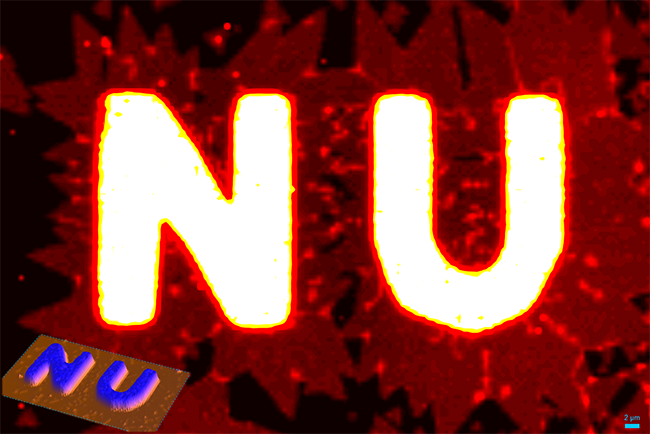 Colors are added for presentation purposes. Instrument used to produce image: Hitachi SEM S4800 – NUANCE Center/EPIC Facility. 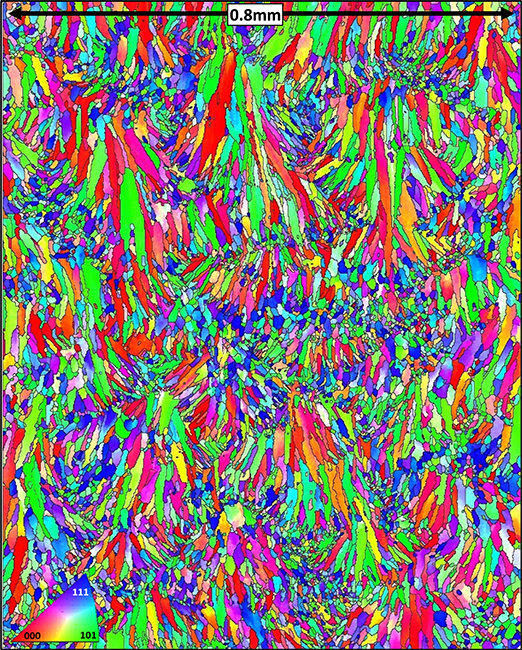 IMAGE: This image comes from a project that is looking at studying thin film composites made of up a polymer matrix filled with small bits of stuff called carbon nanospheres. Ironically, this image is exactly what I do not want to see: multiple spheres sticking together. 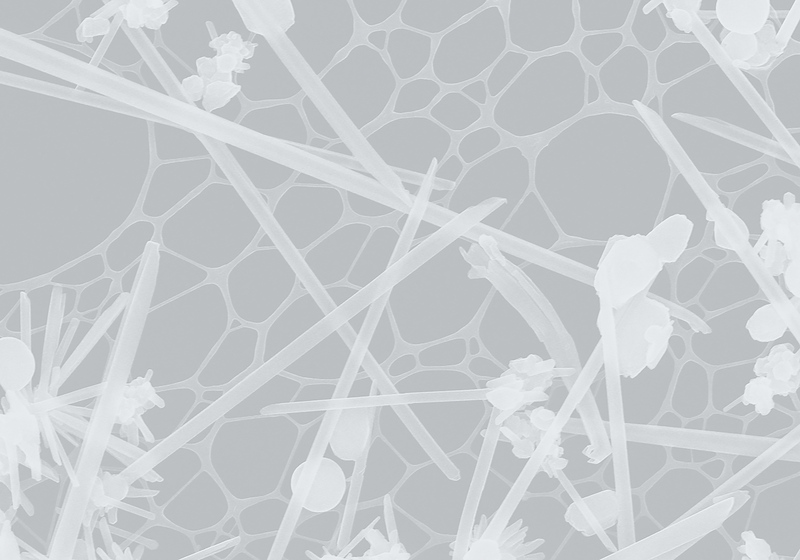 To gain a deeper understanding about how these composites behave in their thin film form, these nanospheres need to be spread out and not stuck together. Thus, trying to break up these clusters has been on my brain. Image taken with help from David Collinson. Instrument used to produce image: Hitachi S4800-II cFEG SEM – NUANCE Center/EPIC Facility. 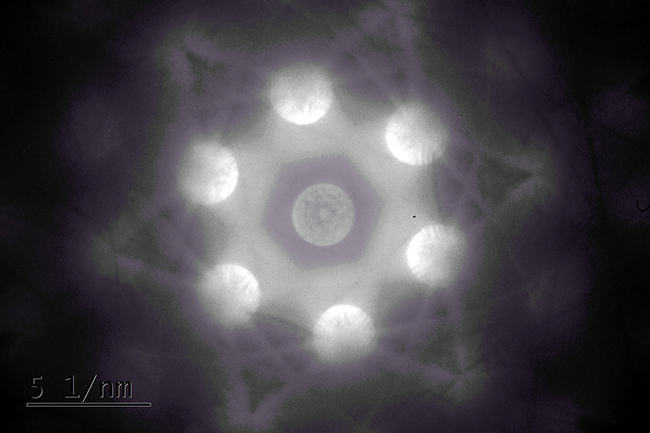 IMAGE: This is a color enhanced Convergent Beam Electron Diffraction (CBED) pattern of a silicon wafer. Diffraction patterns can reveal information about the crystal structure of a material, or reveal the presence of multiple or single phases in a given sample volume. This specific CBED pattern reveals that the silicon is single crystalline and is aligned in the (111) crystallographic direction, which is indicated by the position and spacing of the bright disks. The pattern also reveals a series of lines that can be used to reveal information about atomic spacing and strain in the material. Instrument used to produce image: Hitachi HT-7700 Biological TEM – NUANCE Center/EPIC Facility. 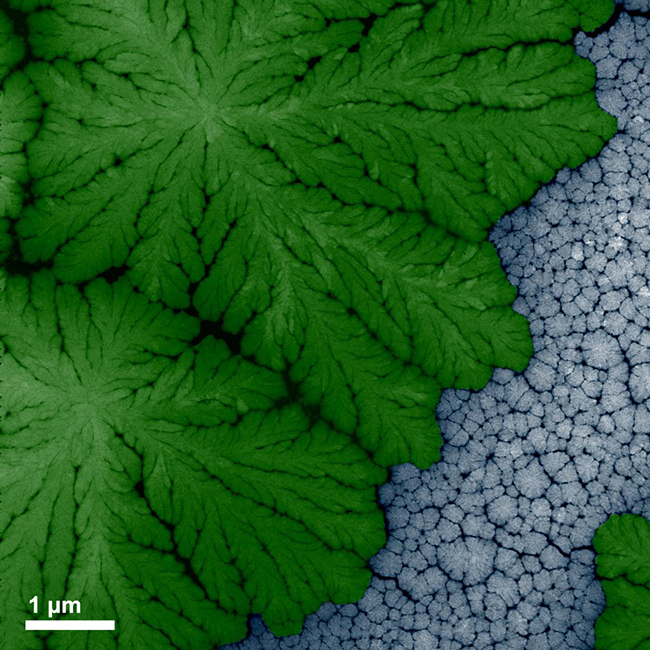 IMAGE: A scanning transmission electron microscopy (STEM) image taken from an electrode material of lithium-ion battery shows the nanoscale dendritic growth of lithium salts inside the electrolyte, generating the fractal nanostructure similar to a branch of natural fern. Instrument used to produce image: JEOL 2100F TEM – NUANCE Center/EPIC Facility. 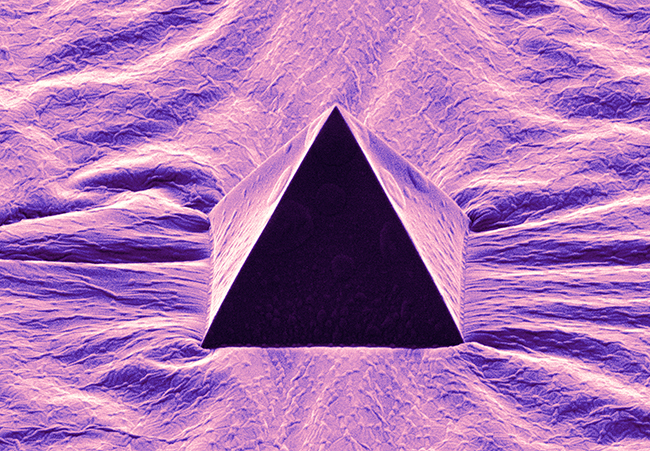 IMAGE: Here is an image of the edge pyramidal tip array designed for soft lithography. These pyramids are originally made with a polymeric elastomer, which glass is then deposited onto the surface of the array with PE-CVD. This deposition is done at high temperatures and as it cools down the polymer shrinks. This shrinkage causes buckling to occur, which is visible on the surface around the pyramid. These hard tips will allow for patterning fine densely packed features onto a substrate for a variety of projects. When pressed against the substrate the glass tip will not deform but rather the polymer underneath will decompress creating finer features than a polymeric tip. Instrument used to produce image: Hitachi SU8030 SEM – NUANCE Center/EPIC Facility. 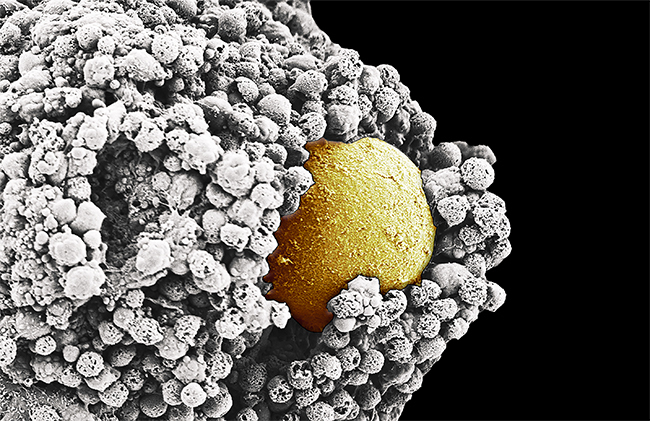 IMAGE: False Colored SEM micrograph of mouse ovarian follicle (mammalian egg unit) on ovarian tissue paper (A new reproductive system biomaterial developed by the Shah TEAM Lab). This particular follicle is in the middle of shedding the protective and supportive granulosa and theca cells (white/gray), exposing the oocyte, the egg cell that is fertilized by sperm (yellow/orange). Instrument used to produce image: LEO Gemini 1525 SEM – NUANCE Center/EPIC Facility. IMAGE: This Raman mapping image is created using SPID LabRam Confocal Raman (NUANCE). The substrate is a “NU” pattern composed of Au@MoS2 core-shell heterostructures and laterally grown few-layer MoS2 flakes. The Raman signal of MoS2 in the “NU” region is significantly enhanced due to the plasmonic effect of Au nanoparticle cores. The inset in the left-bottom corner is a corresponding 3D Raman mapping image. Instrument used to produce image: LabRam Confocal Raman – NUANCE Center/SPID Facility. IMAGE: An SEM image showing a microstructure of a distorted crystal of 4,5-dichloro-2-methylimidazole. The image allowed us to identify both a bending face of the crystal and, when combined with crystal indexing data obtained from single-crystal X-ray diffraction, structural features that permit the crystal to curve during its formation. Instrument used to produce image: Hitachi S-3400-II SEM – NUANCE Center/EPIC Facility. 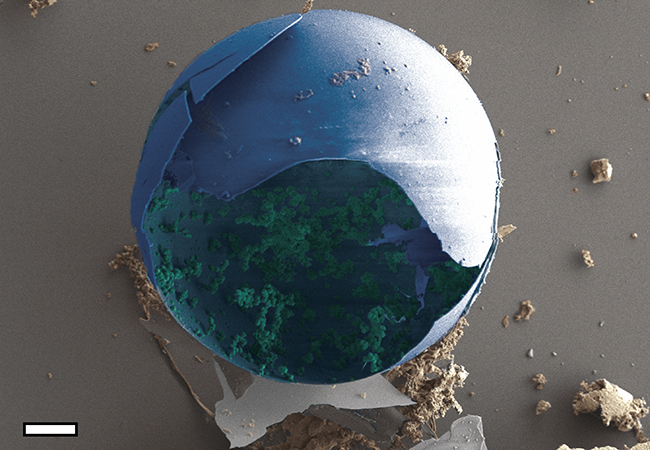 IMAGE: This is a false-colored SEM image of a cracked glass bead, an impurity found in my DNA-functionalized nanoparticle microcrystal sample, and amorphous silica chunks. 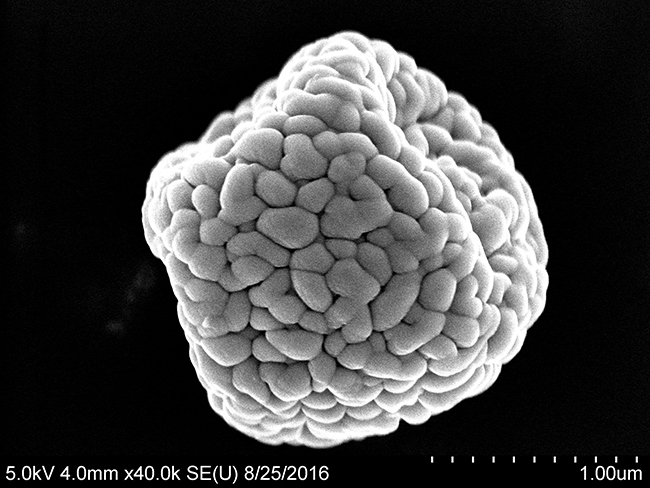 Silica encapsulation is a commonly used technique to transfer solution phase DNA-functionalized nanoparticle superlattices to solid state prior to EM characterization. During the encapsulation process, amorphous silica forms as a side product of nucleation of silane precursors (N-trimethoxysilylpropyl-N, N, N-trimethylammonium chloride and triethoxysilane). The silica chunks (green) in the glass bead remind me of traces of life preserved in a spherical capsule whereas the ones (brown) lying outside are lifeless. Scale bar is 10 um. Instrument used to produce image: Hitachi SEM 8030 – NUANCE Center/EPIC Facility. 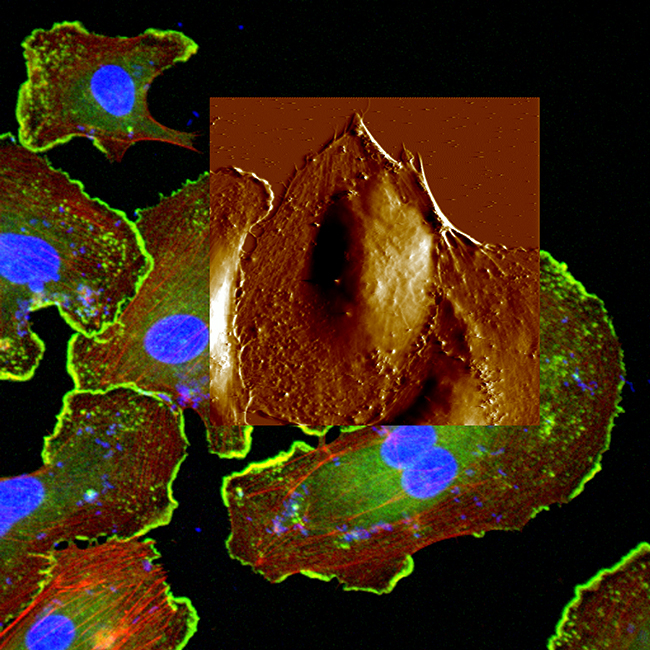 IMAGE: This is correlative image of endothelial cell with AFM PeakForce QNM (Quantitative Nanoscale Mechanical Characterization) and light microscopy image. Green color indicates the immunostaining of focal adhesions, while actin filaments are labeled with red rhodamine-phalloidin, and blue DAPI is used as a counterstain for nucleus identification. AFM PeakForce QNM captures nanomechanical properties—including modulus, adhesion, dissipation, and deformation—while simultaneously 3D topography scanning at atomic resolution. Specific protein distribution, cytoskeleton structure as well as cellular mechanical properties are all integrated in this single image. The cells grown on petri dish substrate look like “color” chickpeas serving as a dish. Instrument used to produce image: Bruker Resolve – NUANCE Center/SPID Facility.